This paper combines the climatological and societal perspectives for assessing future climatic extremes over Kangasabati River basin in India using an ensemble of four high resolution (25 km) regional climate model (RCM) simulations from 1970 to 2050. The relevant extreme indices and their thresholds are defined in consultation with stakeholders and are then compared using RCM simulations. To evaluate the performance of RCM in realistically representing atmospheric processes in the basin, model simulations driven with ERAInterim global re-analysis data from 1989 to 2008 are compared with observations. The models perform well in simulating seasonality, interannual variability and climatic extremes. Future climatic extremes are evaluated based on RCM simulations driven by GCMs, for present (1970–1999) and for the SRES A1B scenario for future (2021–2050) period. The analysis shows an intensification of majority of extremes as projected by future ensemble mean. 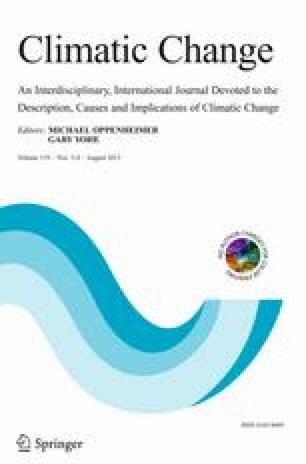 The study suggests that there is a marked consistency in stakeholder observed changes in climate extremes and future predicted trends. The online version of this article (doi: 10.1007/s10584-013-0760-1) contains supplementary material, which is available to authorized users. This work has been supported by the HighNoon project, funded by the European Commission Framework Programme 7 under Grant Nr. 227087.